Sirolo is the place where beaches and breathtaking views are mixed up. At first just a small town fortified around the year 1000, then an ancient feud of Conti Cortesi around 1200 and then a seafaring town, today Sirolo is the “pearl of the Adriatic” made up of alleys and incredible views. Now imagine a strip of white pebbles that sinuously runs along the coast drawing gentle curves. The sea is an experience that awaits you here. Each white beach stands out in the green of the Monte Conero that slips into the blue water. The beautiful beaches of Sirolo to reach by walking along the trails that wind through the shade of fragrant pine trees. The sea here smells of pines and salt. 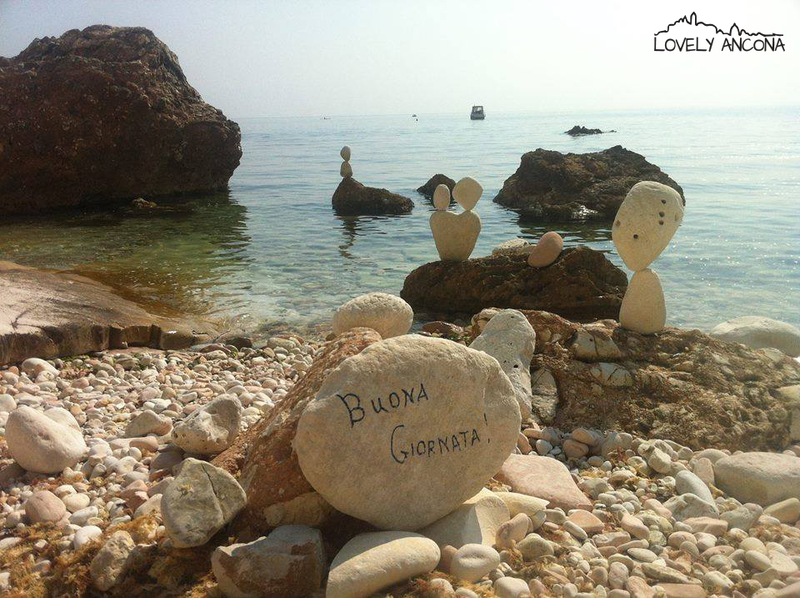 The long line of pebbles of Sirolo begins with Urbani Beach. Here there are beach facilities and restaurants where you can eat great fish. You can reach it by walking along the path leading from the park Sirolo or using shuttles that leave from the town. After Urbani Beach you will find the beautiful beach of San Michele: also this white and fragrant oasis has comfortable sun loungers and restaurants for your pleasure. Imagine the sound of the sea, the sun and heat and in front of you the green mountain that plunges into the sea. You will love it! Take a walk and go to explore the Sassi Neri Beach. No umbrella and no restaurant, only dark stones wet from the crystalline sea. Rent a pedalo or a kayak (you can find them both in Urbani and San Michele beach) and go to discover the characteristic cliffs of Monte Conero. Ladies and gentlemen just around the corner the elegant Due Sorelle are waiting for you! Two white and silent rocks wet by the sea live in this magical place. Once arrived you will feelas if you reached a small piece of paradise. And if you really want to discover all this paradise keep rowing and head to north. You have arrived at La Spiaggia dei Gabbiani. Here there will be no one to disturb you, no noise except the sea and seagulls flying. You will see a small house: this is what remains of Cava Davanzali built in the late nineteenth century where miners and sailors sought shelter. The clear water will make you forget any thought or concern and you will feel again a little children. 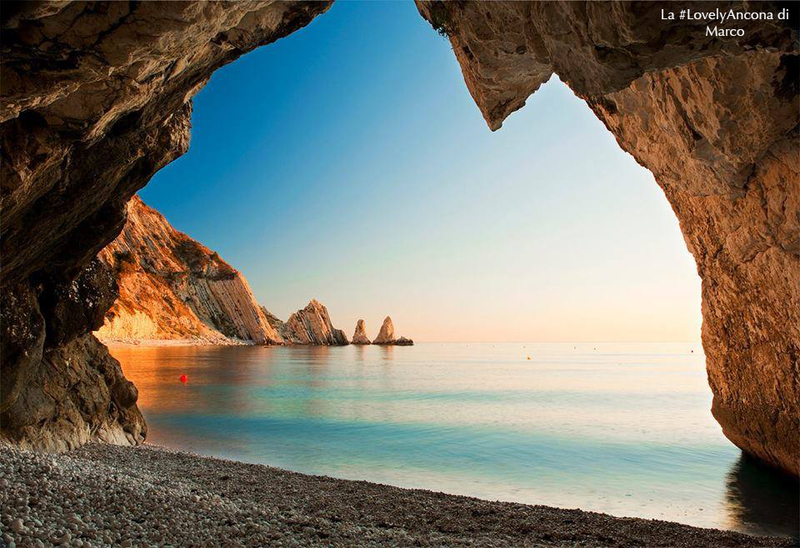 In 2015 the beach of Due Sorelle was recognized as a natural heritage by Legambiente and it was included among the most beautiful beaches in Italy. In Sirolo you can’t miss the the typical alleys. These have a very long history as they were the seat of the various associations of arts and crafts of the town from the earliest times. Thanks to this variety of arts and crafts Sirolo enjoyed a good economy and a certain independence. In time of war it was a strategic point for shelter and hiding. Under these alleys built around the ancient Castle, in fact, were dug underground escape routes, shafts, tunnels and secure rooms used to protect the population by invasions and wars. And after walking through the alleys, visiting churches and saw the old doors, enjoy an unforgettable moment in the square of Sirolo. You’ll find yourself in a suspended balcony surrounded by the sea. The sun setting behind the Monte Conero will color the water awaiting the beautiful moon that rises here directly from seawater. Then visit the Church of St. Nicholas of Bari, built in 1732 on the foundations of a church dating back to the early 1200 and the Church of the Holy Rosary. Built in 1603, this church is a nice example of the baroque style that preserves an interesting painting of Pompeo Moranti dating back to the sixteenth century depicting the Virgin in the center and St. Nicholas of Bari and St. Augustine on the two sides.